Amidst the fog-covered alleys and byways of London, murder and mayhem run rampant. 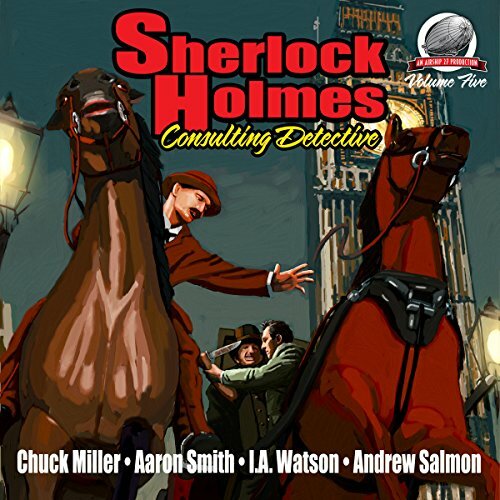 With the dawning of a new century, Consulting Detective Sherlock Holmes and his able assistant, Dr. Watson, represent the forces of truth and justice, ready to confront the villainy of these new modern horrors. Here is another quartet of unique, perplexing cases that will challenge this noble duo and test their fortitude and courage. Why would someone murder an old man a few months before his 100th birthday? Why is Holmes' arch nemesis, Prof. Moriarty, hunting the city for the same sadistic killer Holmes is after? And, when the Great Detective is arrested and imprisoned for attempting to seduce the wife of a wealthy nobleman, Watson questions whether his friend has finally lost his mind. Within these minutes, writers Chuck Miller, Aaron Smith, I.A. Watson and Andrew Salmon offer up four of the most thrilling and suspenseful adventures ever devised to confound Arthur Conan Doyle's most beloved heroes. It is time to load your revolver, hail a hansom cab, and prepare for action, as once again, the game is afoot!